You had a bad time with four consecutive flops after Shouryam film. Then you had a gap of 2 years. You delivered 3 decent films after that. Did that gap help you to retrospect? The gap of 2 years was unplanned for. It came due to B Gopal’s directorial venture which was stalled. After Lakshyam film, I had done many films. But all of them were in same format. There was no growth for me as an actor and my market got stagnated. During the gap, I have retrospected and have decided to give priority to script and novelty. 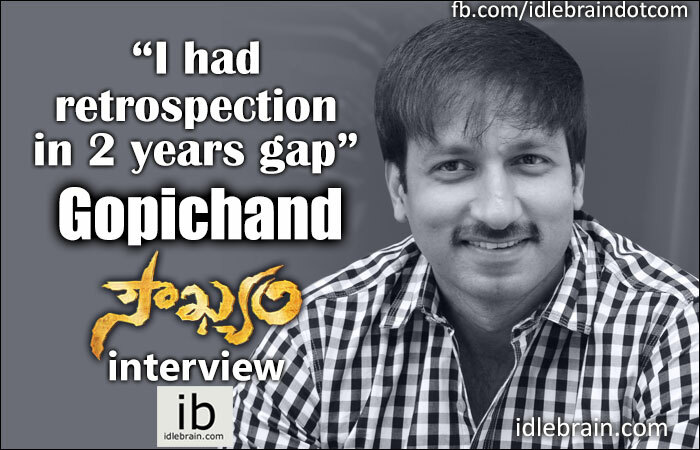 That’s why I did films like Sahasam and Jil. Loukyam was in my zone, but that kind of entertainment pattern was new for me. Your past three films (Sahasam, Loukyam & Jil) have collected a gross of over $200k each in USA. How do you feel about it? I feel good and lucky. I would like to maintain that consistency with selection of scripts. I hope that Soukyam too will repeat it in USA. But, I heard that getting good number of screens is difficult in USA as Christmas is a busy season for Hollywood films. Soukhyam is not a new story. It’s a love story with family bonding. As title suggests, hero always look for his comfort and the comfort of people around him. It’s basically a love story. Story of the film is about how he overcomes hurdles of his love story by convincing the people. This movie will have more action orientation compared to Loukyam. There is humor in the movie from the first scene to the last scene. The family orientation is good. Mukesh Rushi plays my father. His has a positive character. But there is a small conflict between us. The entire story revolves around hero, heroine and their families. Pruthviraj has done a spoof on Baahubali and it will have audiences in splits. Brahmanandam, Krishna Bhagawan, Raghu Babu and Posani Krishna Murali have entertaining roles. I never saw her films before. After AS Ravi Kumar Chowdary suggested her name, I watched Pilla Nuvvu Leni Jeevitham. She is a professional actress and she has given good performance. She is a good dancer too. Soukhyam will give her a good break. Anup Rubens who scored music for Loukyam has come up with peppy tunes again. Devuda song is my favorite. Lollypop item song came out very well. Naakem Thochade is a montage song that’s pretty nice. Venkat has composed fights in different style. Cinematographer Prasad Murella is very efficient. He is an expert at giving superb quality with speed. Sridhar Seepana is a hardworking writer. He has given story and dialogues for Soukhyam. I am happy that producer Anand Prasad is planning to produce a film in Sreedhar Seepana direction very soon. How is the response to music launch of Soukhyam held at your home town Ongole? Ongole is my home town. I studied there till my 2nd standard before shifting to Madras. I remember attending 100 days function of my father’s film Neti Bharatam in Ongole in 1983. I attended another function again for Soukhyam on 13th Dec. It was attended by huge number of crowds and I am amazed and thankful to movie lovers who showered love on me. You have seen Soukhyam. What’s your gut feel? It’s a pleasant and enjoyable fare with humor orientation from the frame one. Tell us about your next film Oxygen? Like everybody else, I too was skeptical about the director Jothi Krishna as his first film was a flop and there was a lot of gap since his last film Kedi (Tamil in 2006) was released. But, he came wp with a bound script. There was a lot of clarity in his narration. It will be in a commercial pattern with loads of action and entertainment coupled with a strong message. I will be doing a film in the direction of Paruchuri Murali who has directed Andhrudu for me in the past. Bhagawan and Pulla Rao are going to jointly produce this movie. The shoot will start in February 2016. My film in the direction of B Gopal is complete but for climax fight and three songs.